I have to fess up. Sport is not my thing. I don't mind watching baseball or cricket, even the occasional game of rugby or American football. So it's no surprise that my interview with Rafael Nadal was not something I was looking forward to. To get a sense of what I was in for, the day before our one on one, I sat in on Nadal's media conference that all tennis players on the ATP have to endure. He seemed unhappy, really unhappy. Short answers and mildly annoyed at the questions (to be fair some of the questions seemed annoying to me as well). 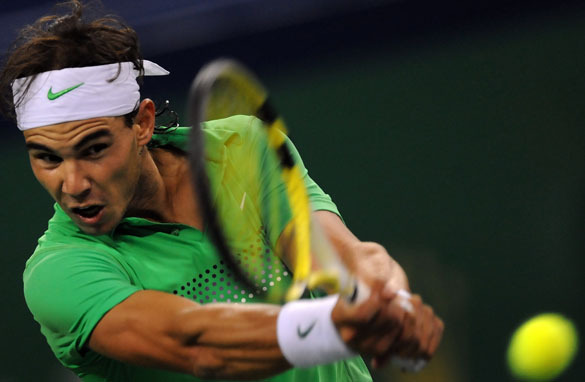 Rafael Nadal in action at the Shanghai Masters. The next day, after much back and forth with the PR people, we were given the go ahead to set up on a practice court, Rafa as they call him, would be ready at 2.30pm. We were told 30 minutes, and he doesn't really like talking about his injuries, personal matters too, and while not off limits, they would probably make him clam up. Oh and he struggles in English, because it's not his first language. Just great – a thirty minute sit down, with one of the world's best tennis players and it was shaping as a bit of a yes no kind of thing, with not much to talk about. I have to admit, I have a dislike for interviewing sportsman. It comes from my days as a sports reporter, twenty years ago. When I failed to know how many times Laurie Daley of the Canberra Raiders had a degenerated disc, or Ricky Stewart hurt his groin, I was ostracized by my fellow journalists which may explain why I prefer Gaza to Old Trafford. So there we were – two camera crews, me and my producer cooling our heels on court number 9. Two thirty came and went and no sign of "Rafa". His fans had started turning up, hoping for a glimpse. As the time went by, I was thinking perhaps they were being overly optimistic. Finally he showed up, almost an hour late – I was already getting my excuses ready about how this show wouldn't work, and couldn't the get some previous episode with an Indian actor out of the library? So, I asked my first question and it wasn't a disaster. I had a sense that Rafa didn't really understand everything that I was asking, but to his credit, he just kept on talking – powering through much like he does on the tennis court. Another and another, and while at first he seemed a little shy and uneasy, by the end, a good 45 minutes later, he had shared some very interesting and personal details. What were they you ask? You'll have to watch the show to find out. it´s really a nice and interesting article, because of what you´ve written about Rafa and you. I can understand Rafa, after each match a press conference and so on. It must be annoying. And on the other hand you, not a great sport fan. I´m looking forward, to see the show. I´m sure it will be a good and ineresting show, or you get a comment. Well, when will the show be aired? And is it on CNN sport or Tennis channel? I can not WAIT to see this show! Your first impressions of Rafa are interesting. I'm sure once the conversation got going, you figured out what everyone else already knows now, and that is: Rafa is the kindest, the sweetest, the most thoughtful young gentleman you could ever meet! He has such a great character and a wonderful personality and a sense of humor. When he is in the mood, asked the right questions by the right journalist, he can be very forthcoming, honest and cerebral. He is courteous and shy and has the warmest smile that could ever dress a face. I'm sure once you were both past the butterflies, the two of you had a blast! Gail, don't worry. I'm sure CNN will post a video of it on their website. If not, no need to worry, this world is absolutely overrun with Rafanatics! I thought your article was refreshing. Not because you have left me & well maybe all Rafa fans hungry for the interview & you have, bugger. But simply you're not a tennis follower so you should hopefully have done this interview with an open mind & a fresh perspective on it as you should have no bias. Some journo's give slanted views & believe me they don't do any favors for themselves or their profession. So looking forward to your interview. Btw, where can I see it? Is there a site where I can at least see a replay if not live? Is the interview on World Sport or Talk Asia? Next time if you don't like the subject please give it a pass. Rafa may not have won the Nobel Peace Prize or attended the APEC Summit but he is significant in the Sports world, and a great role model for anyone. Ask one of the CNN Sports reporters about Rafa and you will regret you didn't do enough homework on him before the interview. 30 minutes is a large chunk of his time as he was in the middle of a major tournament, so at least you could have done is understand, be open-minded and not prejudge him and his answers. After Roger, Rafa is my next favorite tennis player, so I'm looking forward to see this interview. I like the show. It really showed how humble Rafa is! I have been RF's fan but I have to admit that I hated him until today. I actually start liking him as a person and want him to continue challenging Roger on ATP tour. Just watched the show. Its great of CNN to do a focus piece on Rafa-a delight and breath of fresh air and frankly the only reason I turned on CNN at all. Too bad the interviewer did not seem more prepared and asked all the same cliched questions. Nadal is an amazing global phenomenon who crosses over many demographic interests, not just tennis, and not just sports, as a charismatic role model and example of excellence and integrity and the outpouring of Nadalmania all over the world indicates that people are resonating with this. Do a well researched interview with him and examine what makes him such an amazing athlete and more, such an admirable human being and your ratings will soar–I don't think the world can get enough of watching this guy. I thought it was a pretty good interview by John Vause. There were hardly any ind-depth questions about tennis, but if the idea is to present Rafa as a man and as a human being, the interview pretty much accomplished what it had set out to do. I guess the language barrier between interviewer and interviewee was a problem, but Rafa would have been more open had he been as good in English as Roger. It's sad to hear him say that he isn't that confident about playing well into his 30s. Although language is a barrier, Rafa's English is much improved. What the interview did accomplish, though, is to give adoring fans a glimpse of Rafa the human being. What a man! His family must be very proud of producing such a grounded person; every mother's dream son-in-law, such a pity he is spoken for! Despite being one of the most accomplished athletes on the planet, Rafa is shy, humble and fiendly; such a contrast with some other spoilt sports brats. I sound smitten, and I must confess I am. Tennis without Rafa's explosive presence on and off court is simply unthinkable. i so agree with sam111! ! "Sometimes you feel you need to stop. I played every week for a long time and - I forgot - I had to stop for an injury." "After that " instead of "I forgot"... Please check on this. Thanks. I just watched the interview; my thoughts are that he is mature for his age. He may struggle with English but you do get an understanding of what he wants to get across. I agree with what others have said; the interview focused mainly on Rafael then tennis specificaly (Rafa), which is what made it such a great interview. Yes Rafael and tennis are intertwined, but it was refreshing to hear him talk about himself and tennis in general and not about specific points or specific injuries. What I would like to see is an interview with the top 5 tennis players all together asked questions in the same manner as this interview.